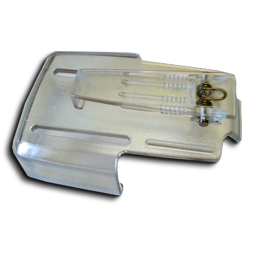 The plastic replacement cradle for SP5 you get as standard with the 1 line alphanumeric pager from LRS. This cradle may look fragile, but nothing could be further than the truth. Its made of premium materials and is extremely robust. Because this cradle is original equipment there are no other suppliers for this unit and no other cradle from any company will fit. An alternative is our pager protector leather case only from LRS UK. While we describe the cradle as being made of 'plastic', in reality these are made from a material called Lexan, which is the strongest type of material in its class that is used for these clips. This ensures that the clip is as strong as it could ever be and is unlikely to fail. The 1 line alphanumeric pocsag pager cradle with belt clip. This cradle securely holds the pager in position. It is designed to also allow the pager to be placed on a belt worn by the user. The belt clip and cradle are extremely robust and we don't replace many of these units but they are available and in stock if you need them. It might be worthwhile considering our sp5 leather cases designed to protect the pager from damage from an accident - such as being dropped. The leather cases will help ensure that your operating costs are kept low and are well worth the small upgrade cost. The 1 line alphanumeric text pager is unique in the paging world. Its robust, designed for where you need the unit to be robust and is rechargeable. A single charge can last as long as 48 hours.